It used to be the case that if you bought a compact camera you’d have a small sensor, and if you went for an interchangeable-lens camera like a DSLR you got a much larger one. This would also typically be reflected in the quality of the images from those cameras, with larger sensors typically producing higher-quality results than smaller ones. To some extent this is still the case. Sensors are typically the most expensive part of a camera to manufacture, and the larger you go the pricier the camera gets. For this reason you won't find expensive models toting 1/2.3-inch sensors, just as you wouldn't find cheap, basic compact cameras with full-frame ones. However, as manufacturers started offering compact cameras with relatively large sensors, and interchangeable-lens cameras with smaller ones, the situation become more complex. Today, we find some small sensors work very well in a range of conditions, while some larger ones may present a handful of benefits over smaller ones in one way, but fall down in another. Sensor technology has advanced rapidly over the past few years, and the breadth of options across all kinds of cameras is likely to confuse many users, particularly first-time buyers who may not be sure what to expect from different kinds of sensors. Furthermore, as the size of sensor has a bearing on the effective focal length of your lens, this becomes yet another thing to consider when choosing a new camera. Here, we list the different types of sensor sizes used in cameras today, in ascending order of size, and how each affects image quality. But before we do that, we need to briefly talk about the relationship between sensor size and focal length. The size of the sensor inside a camera has a direct effect on what kind of lenses can be used with that camera. If you buy a compact camera the lens is built into the body, so there's less to think about here from a buying perspective. But with interchangeable-lens cameras like DSLRs and mirrorless cameras, any lens used needs to be able to have an image circle – the diameter of the light that exits the lens – that can sufficiently cover the dimensions of the sensor. Whether they're built into the body of a camera or supplied separately, lenses are marked with their actual focal length, rather than the effective focal length when used on a particular camera. The problem here is that different lenses marked with two completely different focal lengths may provide the same effective focal range to work with when used on the bodies for which they are designed. To make things easier to understand, manufacturers often provide an ‘equivalent’ focal length, which uses the full-frame sensor as its reference point. A 18-55mm lens used on a camera with an APS-C sensor has an effective focal range of 27-82mm, although the exact length depends on the camera used. Image Credit: Nikon/TechRadar. Here’s an example. A camera with a sensor that’s smaller than full-frame may be used with a lens that has a focal length of 18-55mm, but in reality the effective focal range you’ll end up with is closer to 27-82mm. 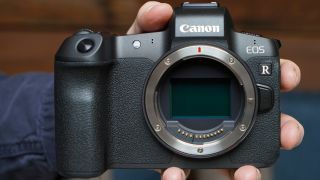 This is because the sensor is not large enough to take advantage of the lens to the same extent as a full-frame sensor can. By discarding some of the peripheral areas of the lens, it ends up appearing as though you’re using a longer focal length. Similarly, a compact camera may have a 19mm lens built into it, but if the size of sensor is smaller than full-frame, it will only ever be able to offer a longer effective focal length on that body, perhaps 28mm or so. This figure is determined by the ‘crop factor’ – that is, the number by which you need to multiply the focal length to work out the effective focal length of the combination. This will be examined in greater detail for some of the sensor sizes below. Here, we take a closer look at the main sizes of sensor used in today’s cameras. Note: not all sensors within the same category have exactly the same dimensions. The measurements provided are an example of one such sensor within that format. Canon PowerShot SX70 HS. Image Credit: Canon/TechRadar. This is the smallest sensor that's commonly used in cameras today, and is typically found in budget compacts. They usually offer between 16-24MP. These used to be common across these types of cameras, but the gradual shift in focus by manufacturers towards enthusiast cameras with larger sensors means they aren't as common in new cameras. Their size allows manufacturers to make very compact cameras with long lenses, such as superzoom compacts like the Panasonic ZS70 / TZ90 and Canon PowerShot SX730 HS. They're also found inside DSLR-style superzoom compacts such as the Canon PowerShot SX70 HS. Using a larger sensor in such cameras would necessitate a larger, heavier and more expensive lens. For general snapshots taken in good lighting conditions, cameras using these sensors may deliver perfectly acceptable results, but otherwise they can struggle to hold on to highlight detail and may produce images with a grainy, noisy texture. Pentax QS1. Image Credit: Ricoh/TechRadar. Slightly larger than the 1/2.3-inch types above, these sensors make it a little easier to separate a subject from its background, and typically offer better performance with regards to holding onto detail in shadow and highlights. As they can capture more light than smaller sensor, they're also likely to perform better in low light. These were once the default choice for enthusiast compact cameras, but their popularity has waned in the face of larger and more advanced 1-inch sensors (discussed below). Some of the most recent cameras to use these include the Pentax QS1, which was announced five years ago. Sony RX100. Image Credit: Sony/TechRadar. This type of sensor is currently a popular choice across a range of compact cameras, with its size making it a versatile but high-performing option. It’s most commonly used in pocket-friendly enthusiast compact cameras. Lenses on these cameras will typically be limited to around 24-70mm or 24-100mm (in 35mm equivalent terms), such as on the Panasonic LX15, Canon PowerShot G9 X Mark II and Sony RX100 VI. It has, however, also now featured in a handful of superzoom cameras from both companies too, like the Panasonic FZ1000 II and TZ200, as well as the Sony RX10 IV. Cameras that use these sensors can typically provide very good quality images, particularly as many of the compact cameras that use them have wide maximum apertures that let in plenty of light. This enhanced image quality is partly the result of their size, but also on the technology on which they're based. Recent versions may be built with an unconventional construction, for example, which enables them to capture light more effectively than standard sensors.